I took a shower this morning. Now, for most people this is not cause for an announcement, sticker or Facebook status, but for me, this morning, it was like climbing Mt. Rushmore. In shorts and flip flops. Carrying a bolder. And I’m really freaking tired and want my gold star. Actually, I want a nap. It had been a week since my last shower. OK, go ahead and judge me. I must be a “dirty person.” I must be “lazy, gross, disgusting, a pig.” Actually, if you saw me, you’d be shocked to know I could go a week without a shower. When I’m seen in public I may not be the picture of “put together perfection” but I am capable of creating a fashionable outfit that matches, accessorize, do my hair and makeup and create and look that that resembles a mature, middle aged, suburban mom. Here’s what you don’t see behind “the look.” Those fashionable LuLaRoe outfits I wear every day to work? That’s about all I can wear right now. The super soft cotton is soothing to my skin that is constantly overreacting to unknown signals from the Fibromyalgia. Any other fabric and my super sensitive skin can’t take it — setting off a painful set of itching, sharp zaps of pain and more. So I stick to super soft cotton. If it’s not super soft, I just can’t wear it. Leggings are a must. Not because I’m lazy or can’t be bothered to put on pants. Finding pants that fit my “Body by Prednisone” makeover has been an impossibility. You see, prednisone, or “The Devil’s Tic Tacs” as we in the lupus community have dubbed them, are a fabulous “wonder drug.” It can take care of everything from poison ivy, to asthma to hives to the inflammation from autoimmune diseases like multiple sclerosis, rheumatoid arthritis, lupus, ulcerative colitis and more. However, like all deals with the Devil, it can come with a price. In the case of long term steroid use, this can include an increase in blood sugar (thanks for the diabetes!) leaching of calcium from bones (osteopenia, woo hoo! ), increased pressure in the eyes (constant checks for glaucoma), and a particularly lovely condition called Cushing syndrome. Moon face, water buffalo hump, excess weight gain in the stomach (no, I’m not pregnant, sigh) — it’s a fabulous look. Then combine with the fact that steroids also can decrease thigh muscle fibers and you can end up looking like a grape with toothpicks! Now try finding pants to cover a swollen belly and skinny legs. I’ve tried every store from regular to plus for ones that work (unless I go to maternity and that will be a bit depressing since my “baby” is 11!) And… we’re back to super soft leggings since I can’t tolerate anything other than, you guessed it, super soft cotton. Layers are a must. Because of a defect in my ability to regulate my body temperature (thanks fibromyalgia plus steroids! ), I can be freezing one moment and sweating profusely another. The ambient temp matters not. Plus, layers are key if I need to cover bruises from blood work or an inadvertent bump into a wall. Or just random ones that occur for no reason other than the fact that I’m on blood thinners for anticardiolipin syndrome. Yeah, another party favor from lupus. Just something else to think of. Makeup and hair are a whole other issue. And don’t get me started on shoes. The point is that I take pride in my appearance. I have a whole fun collection of jewelry I’ve made as occupational therapy to help my fine motor skills. I love bright colors. My husband can usually tell how awful I feel by how nicely I’ve put myself together that day. The more care I’ve put into my appearance (on a day I’ve gone out) he knows that it’s a gauge for how rotten I feel. It’s a coping mechanism. That brings me to today’s celebratory shower. So why did it take me a week to get into the shower? Why would someone who takes pride in her appearance “let herself go” so long? I guess that’s why I’m writing this. You see, when you have chronic illnesses, you can get knocked down to the point where a shower is actually dangerous. Yes, a simple thing that the majority of you, dear readers, did this morning, was actually truly dangerous for me without supervision and help. After four days in the hospital for a lupus flare with bronchitis kicker, I’m so weak that I can barely get off the couch. Walking from the living room to the kitchen to replenish my water supply (which is crucial) leaves me winded. Walking up the stairs, I need to stop several times and catch my breath and hold the railings. I tried to get into the shower yesterday only to get dizzy and almost pass out. As someone on blood thinners (remember that pesky anticardiolipin syndrome) and I’ve already had a pulmonary embolism, passing out is really bad (they frown on brain bleeds) I have to be super careful. The actual shower itself usually feels soothing for most people. I used to love a nice, long hot shower. When I’m in a flare, a hot shower is torture. Just the feeling of the water droplets hitting my sensitive skin can feel like knives. The temperature fluctuations wreak havoc on my balance. My husband has to hold me up and wash me like an infant as I struggle to keep myself upright. It’s a special kind of trust. It’s an intimacy that is borne of years of living with chronic illness as another member of the family. It’s a last resort when I’m just too weak to care for myself. So today I took a shower. And now I need a major nap. But I’ll take that gold star first, please. I am a mother, wife, teacher, and battle Lupus, Fibromyalgia, Asthma, Diabetes and more. I refuse to be defined by my illness! 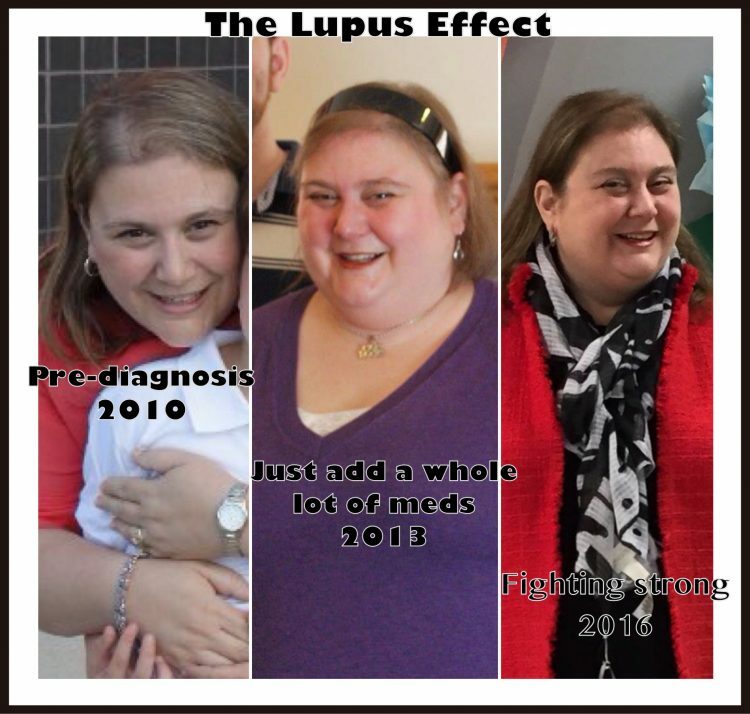 I may have Lupus but it will never have me!